Business Insider: You seem very cheerful lately, as if the rough period Cisco had from 2010 to 2013 is well behind you. You feeling happier? 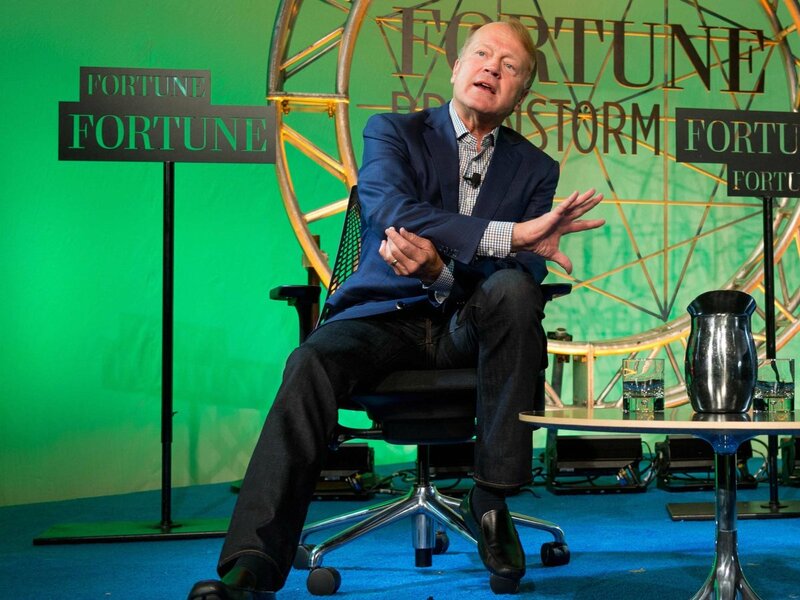 John Chambers: No. I’ve never — in almost 20 years of being CEO — I’ve never raised my voice in the office. That doesn’t mean that people don’t know when I’m displeased or when I think people have done a good job. As a leader, you don’t get too high on the highs or let the bumps balance down. Every leader over time has probably equal amount of good luck or bad luck — or, you could argue, has good opportunities or challenges. BI: How do you decide when firing someone? Do simply know in your gut that it’s the right decision? JC: Well, no. The hardest decision you do is to let someone go, especially someone that’s a good person and is trying hard. A well-run organization turns over 10% of their organizations, including senior leadership. I don’t have the heart to do that. But we need to run at 3% to 5% in voluntary attrition. We need to do that a little better — we run at 3%. When a leader doesn’t do his or her job it isn’t just a problem with the person. They take their whole organization down. Often what I tell a new CEO asking for advice, or one of my own new leaders, is the two most important decisions that your team is going to watch is the first person you hire and the first person you promote — because you are saying that’s the type of person I want. And the first person you fire. BI: You say you “don’t have the heart” to run at 10% turnover. Why not? JC: I’m not a tough person. I cry at movies. I’m not a particularly proud of that, but I do. I follow every illness — of every employee, their spouse, children — that’s life-threatening. This last week there was a number of them. It’s about getting a person who has breast cancer into the right doctors at Duke, or getting a secondary opinion, or helping someone who has lost a spouse unexpectedly, talking to the person to see what we can do. That’s who we are as a company. You can say we’re too soft, but we are family and it’s actually very powerful. BI: Cisco has done well over the years, but it’s also had tough times, layoffs, a reorg, unwinding some acquisitions — Flip and Linksys. What advice do you have for entrepreneurs on when to stand firm and when to cut and run? JC: You never know for sure. What you do is develop guidelines or principles for key decisions. We’re pretty disciplined on where we’re going strategy-wise. We build those strategies off of “market transitions” [disruptive new technologies]. Unless there’s a market transition that plays to our strengths, like networking, we don’t think we can enter a market that’s already established and out-execute. Our guidelines are a minimum target of 40% market share and “sustainable differentiation” with good industry-average margins. That sounds basic but “sustainable differentiation,” that’s the advice I’d give to startups. Do they really have something that’s different? Or is it temporary, and then they’ll have to do something else? Also, is there a transition? Great startups that become great companies are catching that transition. You see that especially, interestingly enough, during economic slowdowns, because there aren’t as many players going after [the new market]. If no transition is going on, thinking you can be the 20th person into the market become No. 1, 2, 3. It isn’t going to occur. No. 20 isn’t going to make it. JC: First, do you have the same vision of where industry is going as the target of your acquisition? If visions differ, you might get together economically for a while, but then you are going to have problems. Second, understand what you are acquiring and protect it at all costs. In my industry, you are acquiring people and next-generation products. You are making an investment that together you can grow faster, make more profits, and take more market share. If I can’t hold the people, and our cultures aren’t very similar, we don’t do it. BI: How do you know if the cultures are similar? JC: You know at the beginning. You listen to them: if they mention customers, if they share the success of the company with their employees, or just a couple of people at the top make all the money. Do they have a healthy paranoia? When riding high, do they know that they can get unseated fairly quickly? That’s what Silicon Valley is about. We all know we can get unseated very quickly — as quickly as two years. Third, is the acquisition really strategic? The failure rate is 90% for most acquisitions. If Cisco is world class, as many people say we are, with acquisitions, we’re going to do well with two out of three. That means we’re still going to miss on one out of three. Fourth, geographic proximity is very important. Once you get out of the country, odds go down even more. BI: For a while, weren’t you targeting non-U.S. acquisitions, mostly for tax reasons. JC: Still am. But it makes it harder. You just go with your eyes wide open. You also don’t go with a company that doesn’t have “sustainable differentiation” or with a culture that’s different. We learn how to catch market transitions, enter them only where we have sustainable differentiation, and then [fifth] we listen to our customers. If you listen to them the right way, they’ll tell you who to acquire, they’ll tell you what you are doing right and wrong. They’ll tell you what your challenges are in the future, and what their top issues are. That’s why I listen to every critical account every night and have for 20 years. [Sixth]: Focus on solving a customer’s problems. As basic as that sounds, that’s what Cisco does. What I do as CEO. BI: Philanthropy is a big topic in the Valley these days. In your opinion, what’s the obligation of the 1%? JC: Both of my parents were doctors, and I firmly believe that those who have been successful in life owe an obligation to those who have not. So almost all of the giving by Elaine and I is to education or healthcare that can really make a difference. As you follow all the employees who have breast cancer, or prostate cancer or lost a child, the ability to make a difference when it can, I believe it’s an obligation. That’s especially true at a company like Cisco where you can also help with donations of technology to places like the people in Mississippi, with education, or in Sichuan Province, with the earthquake or the people in Palestine to build a middle class. What people don’t often know — it’s just plain good for business. We’re No. 1 in almost every area of social responsibility. And while we make mistakes, customers and others forgive us. They do in part because they trust us. Nobody’s perfect. Make no mistake, I am not — as my wife will tell you. But we try to be good people. BI: Did you sign Bill Gates’ “Giving Pledge,” where the wealthiest vow to give large chunks of their fortune to charity? JC: Do I need to sign a giving pledge to give? No. So I now talk about it publicly, even though it makes me a little uncomfortable. BI: So after all these years, what’s your favorite part about being rich and famous? Steve Ballmer said his was the ability to get a great tee time wherever he went. JC: I have very little interest or desire to be rich and famous. That doesn’t mean it isn’t nice to have money. It is. It takes stress out of life. But fame and money has never been very important to me other than what our company can do to change the world. That is a tremendous excitement. If you can change a Palestine or an earthquake or a hurricane in U.S. or an industry or business. We want to change the standard of living for everyone in this world. Change healthcare. Change every city, every business — and make money doing that. A lot of money for the company, shareholders, employees. If your pupils don’t dilate at that thought, something is wrong with you.